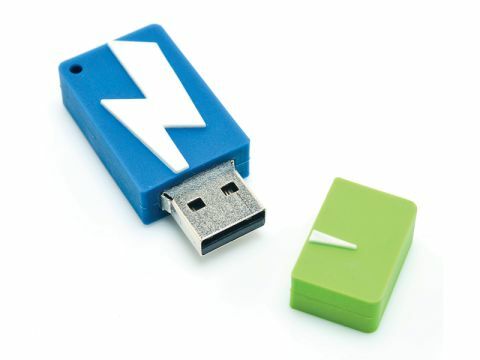 The capacity of USB flash drives has risen steeply, with 16GB becoming common place. The GigaRunner might seem small at 4GB, but this drive has some network-enabled tricks up its sleeve. Most of us have hard drives 500GB or more these days, so while we might be able to fit a lot of our important files and folders on a flash drive, the ideal of having access to any of our files from another system is still a distant one. Of course, there's cloud backup and synchronisation services but if you're after anything more than 20GB of space things start getting expensive. The GigaRunner's 4GB space isn't much to write home about but it's the GigaRunner software which is really interesting. After a quick setup, creating a server on our main PC, we were able to plug the USB stick into another PC and browse and download any file from our main rig. It worked really well, and the interface made it easy to navigate files and folders from our remote computer. Files you download and then edit can't be uploaded back onto your main PC. This is where the 4GB capacity comes into play. Another drawback is that your main PC needs to be constantly on and connected to the internet.